During the last decades, the use of composite resins for esthetic restorative procedures has increased owing to improvements in adhesive systems and composite resin materials. Due to the advancements in filler technology, the fillers in composite resins changed from macroparticles to nanoparticles through which esthetic and mechanical properties of the materials are improved. Besides the traditional filler particles, most nanohybrid resin composites contain small concentrations of nanofillers and/or nanofiller clusters that increase the filler load, improve mechanical properties, and produce highly polishable surfaces. Nanocomposites exhibit high translucency and smoothness retention similar to those of microfilled composites while maintaining the physical properties and a wear resistance equivalent to those of several hybrid and microhybrid composites. Therefore, by virtue of their strength and esthetic properties, nanocomposites are recommended to be used in both anterior and posterior restorations.,,, In spite of numerous studies about the clinical performance of posterior composite restorations,,, evaluation of anterior direct composite resin restorations and direct composite buildups within past decades have been rare,, as are data on their performance. The objective of this clinical study, therefore, was to evaluate and to compare the clinical performances of two nanohybrid resin composite systems used for anterior diastema closure and tooth reshaping during 4 years. The hypothesis tested was that both nanohybrid resin composites with their bonding agents would function similarly in clinical conditions. The study protocol was approved by the Ethical Committee of Hacettepe University, Ankara, Turkey and the Ethical Committee of Ministry of Health (protocol HEK 2014/03-14 (KA-14004)). Between December 2011 and August 2012, a total of 23 patients (6 males, 17 females, mean age: 31.27) with maxillar anterior midline or multidiastema problem received 76 direct composite resin restorations. Before entering the trial, all patients were asked to sign an informed consent form and information was given to each patient regarding the alternative treatment options. The inclusion criteria were as follows: All participants were required to be at least 18 years old, able to read and sign the informed consent document, physically and psychologically able to tolerate the restorative procedures, having no active periodontal or pulpal diseases and willing to return for follow-up examinations as outlined by the investigators. The exclusion criteria were uncontrolled parafunction, insufficient oral hygiene leading to caries lesions more than twice yearly during the previous 2 years, being pregnant or nursing and having periodontal disease. The teeth to be restored were first cleaned with pumice-water slurry using a rubber cup. The appropriate shade of restorative material was selected using a standard VITAPAN® Classic shade guide, and initial intraoral photographs were taken. Teeth were then isolated using cotton rolls, and Mylar strips were placed with the help of wedges interproximally to achieve a smooth and overhang free restoration outline in the cervical area and to form final restorations. The surfaces to be restored were etched using 35% orthophosphoric acid for 30 s according to the restorative system used. The etched surfaces were rinsed and dried. The nanohybrid composite resin systems to be used on each patient were randomly selected. Thirty-seven teeth of 10 patients were restored with Filtek-Z550 (3M/ESPE, St. Paul, MN, USA) in combination with Adper™ Single Bond 2 (3M/ESPE, St. Paul, MN, USA) etch and rinse adhesive; whereas 39 teeth of 13 patients were restored with Charisma-Diamond (Heraeus Kulzer, GmbH, Germany) in combination with Gluma2 Bond (Heraeus Kulzer, GmbH, Germany) etch and rinse adhesive by two operators. Every material used in this study was used according to the manufacturers' instructions [Table 1]. The composite increments were carefully placed between the matrix strip and tooth using a hand instrument. The matrix was then gently closed facially beginning from the gingival aspect., When restorations for tooth shape corrections covered a large portion of the labial surfaces, the mesial and distal buildups were joined labially. Therefore, the composite buildups for shape correction were performed as single restoration including labial and proximal surfaces. Then, the restorations were light cured using a photo-curing light (Radii Plus, SDI, Bayswater, Australia), by placing the tip of the device 2 mm away from the composite resins. The curing light intensity was measured before and after application to ensure that the light output was never below 600 mW/cm2. Restorations were gradually buildup by layering the composite resins with maximally 2 mm thick increments to obtain the final shape or contour as described above., Occlusion was checked with thin articulating papers. Lingual restoration surfaces were finished and polished with fine finishing diamond burs, stones, and rubber cups whereas proximal and labial surfaces were contoured and polished with Finishing Strips (3M/ESPE, St. Paul, MN, USA). The treatments were completed by instructing the patients about the oral hygiene measures for cleaning their restorations with toothbrush and dental floss. Furthermore, the patients were instructed regarding the evaluation periods and were requested to cooperate. Patients were also instructed to call on any kind of failure. Then, intraoral photographs were taken to assist further evaluation at baseline and each control period for evaluating the short- and medium-term changes in the restorations. Two calibrated observers who were blinded to the objective of this study performed the evaluations. For maximum validity, the observers were calibrated using the web-based training and calibration tool www.e-calib.info recommended by foreign direct investment (FDI). 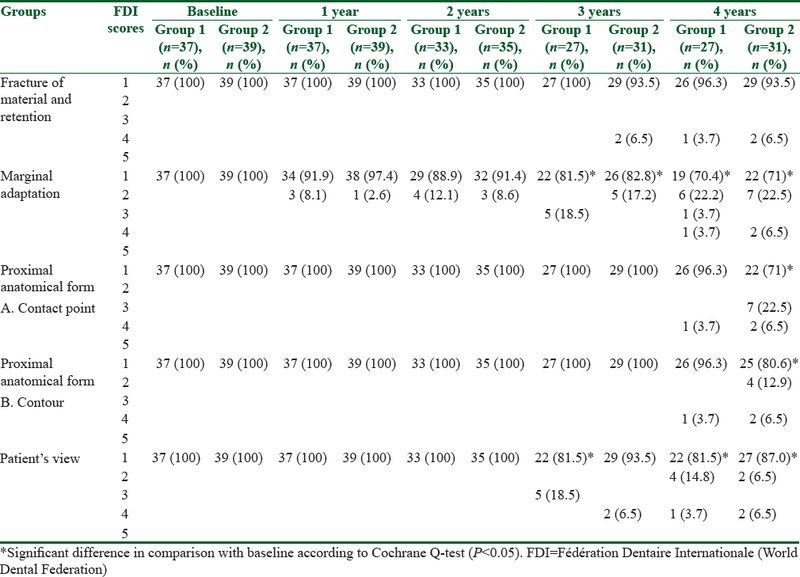 Both observers evaluated the esthetic, functional, and biological properties of the restorations independently at baseline, 1, 2, 3 and 4 years using FDI Criteria establishing a score-range of 1–5 (1-clinically excellent/very good, 2-clinically good, 3-clinically sufficient/satisfactory, 4-clinically unsatisfactory, and 5-clinically poor). After data collection, in case of discrepancies in scoring, restorations were evaluated again, a consensus was reached, and this was accepted as the final score. Statistical analysis was performed with SPSS version 15.0 software (IBM Corp., Chicago, IL, USA). To compare the performance of restorative materials according to FDI criteria over the study period, the Fisher's Chi-Square test was used. The Cochran Q-test was then used to compare the 1, 2, 3, and 4-year scores of each material with baseline scores to evaluate the changes of each dependent group by the time. Survival curves were obtained using Kaplan–Meier method. P < 0.05 was considered to be statistically significant in all tests. The mean observation time was 43.4 months with a minimum observation period of 37 months and maximum 48 months. During the evaluation period, 4 patients with 18 restorations (eight Charisma-Diamond restorations bonded with Gluma 2Bond and 10 Filtek Z550 restorations bonded with Adper Single Bond 2) dropped out from the study, and at final recall, 19 patients with 58 restorations were evaluated (recall rate 82.6%). Two Charisma diamond restorations were repaired due to partial fracture at 3 years, and 1 Filtek-Z550 restoration was repaired at 4 years with the same reason. Overall, survival rates of the Filtek-Z550 and Charisma-Diamond restorations were 96.3% and 93.5%, respectively [Figure 1]. 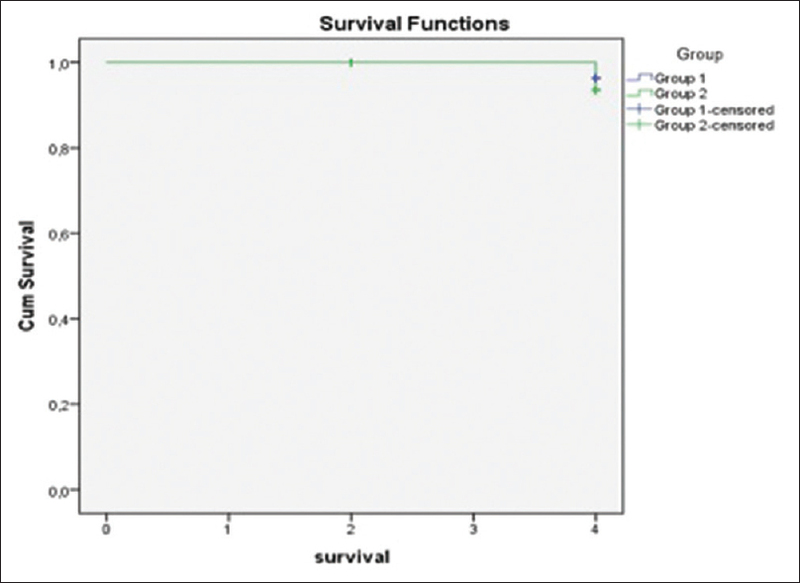 The survival rates of the groups did not show significant differences (P = 0.64). 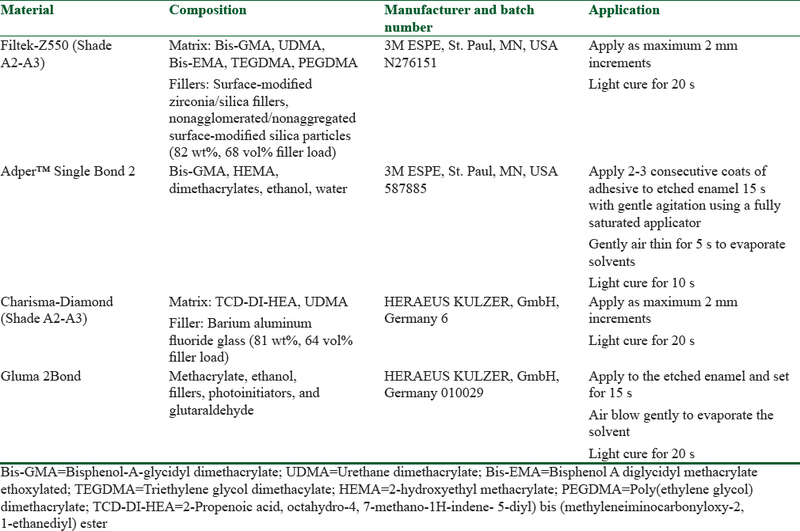 In [Table 2], the evaluation findings of the esthetic properties for the restorations are shown. At 4 years, the surface luster of 7 Filtek-Z550 restorations and nine Charisma-Diamond restorations were scored as 2. Six Filtek-Z550 restorations and five Charisma-Diamond restorations exhibited minor surface staining (Score 2). Minor marginal staining (Score 2) was observed on 10 Filtek-Z550 restorations and nine Charisma-Diamond restorations whereas two Filtek-Z550 restorations showed moderate marginal staining (Score 3). Two Filtek-Z550 and six Charisma-Diamond restorations revealed minor deviations in shade and translucency (Score 2). The form of two Charisma-Diamond restorations slightly deviated from normal (Score 2) whereas unacceptable deviations that need intervention (Score 4) were observed for one Filtek-Z550 at 4th year and for two Charisma-Diamond restorations at 3rd year. The rest of the restorations in both groups were clinically excellent (Score 1) and there were no significant differences between two groups at any recall for the esthetic properties assessed (P < 0.05). The findings of the functional properties of the restorations are summarized in [Table 3]. Less than half of the one Filtek-Z550 and two Charisma-Diamond restorations were fractured and lost (Score 4) during 4 years. Those restorations were also clinically unsatisfactory but repairable (Score 4) for marginal adaptation, proximal anatomical form, and patient's view. Six Filtek-Z550 and seven Charisma-Diamond restorations exhibited minor irregularities in marginal adaptation (Score 2). Major irregularities were observed in Filtek-Z550 restoration, which were clinically acceptable (Score 3). Somewhat weak proximal anatomical contacts within clinically acceptable limits were observed on 7 Charisma-Diamond restorations (Score 3). Four Charisma-Diamond restorations showed slightly deficient contour (Score 2). Patients' views were clinically good for four Filtek-Z550 and two Charisma-Diamond restorations (Score 2). Besides, the differences on the functional properties of the restorations were not significantly different at any time (P > 0.05). Representative photographs from each group are shown in [Figure 2] and [Figure 3]. [Table 4] shows the clinical evaluation results of the biological properties. At 4 years recall, little plaque accumulation without gingival inflammation and pocket development were observed on 4 Filtek-Z550 and three Charisma-Diamond restorations (Score 2). The adjacent mucosa of two Filtek-Z550 and two Charisma-Diamond restorations would be entirely healthy after minor removal of mechanical irritations (Score 2). The biological properties of the rest of the restorations in both groups were clinically excellent (Score 1), and again no significant differences were observed between two groups during 4 years (P > 0.05). When the performance of each material was individually evaluated, Cochrane Q-test pointed some significant deteriorations on the esthetic, functional, and biological properties during 4 years in comparison with baseline. Filtek-Z550 restorations started to exhibit slight deviations on surface luster at 4 years whereas the deviations started at 3 years for Charisma-Diamond restorations (P < 0.05) [Table 2]. Minor surface stainings started to be seen since 1 year for Charisma-Diamond restorations and at 4 years for Filtek-Z550 restorations (P < 0.05). Mild degradations were observed on marginal staining for Filtek-Z550 restorations at 4 years and for Charisma-Diamond restorations at 3 and 4 years (P < 0.05). Charisma-Diamond restorations started to exhibit minor deviations at color match and translucency at 3 years (P < 0.05). Deviations were also seen on anatomical form of some Charisma-Diamond restorations at 4 years (P < 0.05). For marginal adaptation, deviations were started at 3 years both for Filtek-Z550 and Charisma-Diamond restorations (P < 0.05) [Table 3]. Proximal anatomical contact and contour form started to change at 4th year in Charisma Diamond group (P < 0.05). Patient's view slightly changed at 3 and 4 years for Filtek-Z550 restorations and at 4 years for Charisma-Diamond restorations (P < 0.05). Little plague accumulation around 4 Filtek-Z550 and 3 Charisma Diamond restorations without any sing of inflammation in periodontal tissues were also observed at 4 years (P < 0.05) [Table 4]. However, except two Filtek-Z550 and one Charisma-Diamond restorations that were partially fractured, all the degradations in both groups were still in clinically acceptable limits. During the last two decades, the use of resin composites for esthetic restorative procedures has increased owing to improvements in adhesive systems and composite resin materials. Compared with indirect restorations, reshaping teeth, and closing diastemas with contemporary direct composite buildups are advantageous, especially in the treatment of healthy teeth wherein a maximal tissue-saving approach is imperative. In general, composite resin restorations are reported to have promising results with the claim to be strong, to stay in place for many years, and to have excellent esthetic potential which enables to accurately simulate the appearance of normal tooth structure. They also cost much less than equivalent indirect restorations., Therefore, this study was planned to evaluate and to compare the clinical performance of two nanohybrid composite resin systems for diastema closure and tooth reshaping. The hybrid composites were reported to have a better overall performance regarding esthetic properties and fracture than microfilled composites. On this respect, two nanohybrid composite resin systems with different properties, both of which were launched with the claim to have very high esthetic and mechanical properties, were used and compared in the present study. Filtek Z550 is reported to include 82 weight %, 68 volume % surface-modified zirconia/silica fillers and non-aggomerated/non-aggregated surface-modified silica particles, whereas Charisma-Diamond includes 81 weight %, 64 volume % barium aluminum fluoride glass nanofillers. Besides the differences on their filler types, filler loads and concomitant bonding agents; the clinical performance of both nanohybrid composite resin systems were satisfying for esthetic, functional, and biological properties, and there was no significant difference between two materials during 4-year follow-up. Taking a closer look at the esthetic parameters; all the restorations were clinically either excellent or good for surface luster, surface staining, margin staining, color match, and translucency without need of any correction at the end of 4 years. Peumans et al. evaluated the 5 years clinical performance of direct composite buildups for tooth reshaping and reported that only 89% of the restorations were esthetically satisfactory while the remaining restorations required replacement due to severe color mismatch and severe loss of anatomic form. In the current study, although unacceptable deviations that needs to be repaired to improve the anatomical form were observed for 1 (3.7%) Filtek-Z550 and 2 (6.5%) Charisma-Diamond restorations, none of the restorations required to be replaced during 4 years. Furthermore, the rest of the esthetic properties were even better when compared with their results. The diversity of these results might be due to the use of nanotechnology-based modern composites in this study, which are reported to have improved mechanical and esthetic properties., Supporting our results, Demirci et al. evaluated the 4 years clinical performance of a nano (Filtek Supreme XT) and nanohybrid (CeramX Duo) composite buildups for diastema closure and reported that all the restorations were clinically acceptable for the esthetic criteria assessed. When it comes to the functional parameter evaluations of the present study, the 4-year survival rates for Filtek Z550 and Charisma-Diamond restorations were 96.3% and 93.5%, respectively. 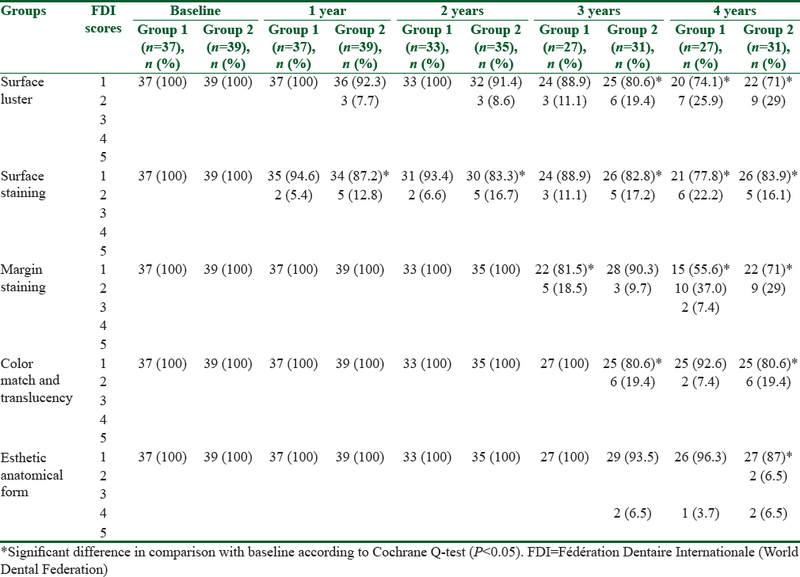 Our results are in accordance with the results of Demirci et al., who reported that the 4-year survival rates for Filtek Supreme XT nano and CeramX Duo nanohybrid composites were 92.8% and 93% when used for diastema closure and teeth recontouring. In another study, Coelho-de-Souza et al. retrospectively evaluated the clinical performance of direct anterior composite buildups in vital and nonvital teeth and reported a 95.1% survival rate for vital teeth at the end of 3.5 years. On the other hand, survival rates of the present follow-up investigation are slightly higher than results of some other studies that evaluated teeth reshaping and diastema closure using direct composite buildups., Among those, a clinical study evaluated 176 direct composite buildups and obtained a 5-year survival rate of 84.6%, whereas the other study investigated 284 direct composite buildups and obtained a 5-year survival rate of 79.2%. Peumans et al., also clinically evaluated 87 direct composite buildups to correct tooth form and position in 23 adults and reported a 5-year survival rate of 89%. The use of different dentin bonding agents, composite resin systems and evaluation periods may have contributed to the differences in the results. As the restoration sizes have also been reported to influence the clinical performance of direct composite buildups,, different restoration sizes on those studies might be another reason for the differences on the survival rates. On the other hand, when we look at the unacceptable restorations, we can see that only 2 Filtek-Z550 and 1 Charisma-Diamond restorations were partially fractured during 4 years, which required to be repaired. No cases of complete failure were observed which aids for replacement. It becomes evident that repairability is, besides other advantages, the most important factor extending the survival of direct composite resin buildup., Since minor fractures and chippings can easily be repaired using the state-of-the-art adhesive repair techniques, and repaired restorations remain in function, functional survival can be increased., This is of great benefit to the patients who experience shorter treatment time and lower treatment cost, and it also benefits prognosis of the teeth, which are kept from entering the cycle of repeated restoration., Besides, the possibility of instant and minimally invasive repair of composite resins and the broad range of options for changing the shape or color– even after long in vivo periods– point to the flexibility of “direct composite resin buildup” approach. In the present study, the most frequent deteriorations were observed on surface luster, surface/margin staining, marginal adaptation, and patient's view for both of the restorative materials according to baseline. Charisma-Diamond restorations additionally exhibited slight degradations on color match and translucency, esthetic anatomical form, and proximal anatomical form. However, all those degradations were within mild-to-moderate limits, and the restorations were still clinically acceptable after 4 years of clinical service. Survival data and quality outcome of this evaluation implies that direct composite resin buildups with the current nanohybrid composites might be able to fulfill the objectives; superior esthetic and functional characteristics; adequate biological properties; improved subjective and objective appearance of the treated teeth; and acceptable survival time by applying adequate adhesive techniques. Direct composite buildups may provide an almost excellent treatment alternative for the esthetic correction and reshaping of anterior teeth n clinical cases, in which a noninvasive treatment approach is indicated. The authors would like to thank to Heraeus Kulzer and 3M ESPE for material support. This study was financially supported by 3M ESPE, Heraeus Kulzer. Wolff D, Kraus T, Schach C, Pritsch M, Mente J, Staehle HJ, et al. Recontouring teeth and closing diastemas with direct composite buildups: A clinical evaluation of survival and quality parameters. J Dent 2010;38:1001-9. Frese C, Schiller P, Staehle HJ, Wolff D. Recontouring teeth and closing diastemas with direct composite buildups: A 5-year follow-up. J Dent 2013;41:979-85. Demirci M, Tuncer S, Öztaş E, Tekçe N, Uysal Ö. A 4-year clinical evaluation of direct composite build-ups for space closure after orthodontic treatment. Clin Oral Investig 2015;19:2187-99. Gresnigt MM, Kalk W, Ozcan M. Randomized controlled split-mouth clinical trial of direct laminate veneers with two micro-hybrid resin composites. J Dent 2012;40:766-75. Stefanski S, van Dijken JW. Clinical performance of a nanofilled resin composite with and without an intermediary layer of flowable composite: A 2-year evaluation. Clin Oral Investig 2012;16:147-53.
de Andrade AK, Duarte RM, Medeiros e Silva FD, Batista AU, Lima KC, Pontual ML, et al. 30-month randomised clinical trial to evaluate the clinical performance of a nanofill and a nanohybrid composite. J Dent 2011;39:8-15. Cetin AR, Unlu N. One-year clinical evaluation of direct nanofilled and indirect composite restorations in posterior teeth. Dent Mater J 2009;28:620-6. Da Rosa Rodolpho PA, Donassollo TA, Cenci MS, Loguércio AD, Moraes RR, Bronkhorst EM, et al. 22-year clinical evaluation of the performance of two posterior composites with different filler characteristics. Dent Mater 2011;27:955-63. Heymann HO. Additional conservative esthetic procedures. In: Sturdevant CM, editor. The Art and Science of Operative Dentistry. 4th ed. St. Louis: C.V. Mosby Co.; 2002. p. 591-650. Hickel R, Peschke A, Tyas M, Mjör I, Bayne S, Peters M, et al. FDI world dental federation – Clinical criteria for the evaluation of direct and indirect restorations. Update and clinical examples. J Adhes Dent 2010;12:259-72. Macedo G, Raj V, Ritter AV. Longevity of anterior composite restorations. J Esthet Restor Dent 2006;18:310-1. Breschi L, Mazzoni A, Ruggeri A, Cadenaro M, Di Lenarda R, De Stefano Dorigo E, et al. Dental adhesion review: Aging and stability of the bonded interface. Dent Mater 2008;24:90-101. Vaidyanathan TK, Vaidyanathan J. Recent advances in the theory and mechanism of adhesive resin bonding to dentin: A critical review. J Biomed Mater Res B Appl Biomater 2009;88:558-78. Peumans M, Kanumilli P, De Munck J, Van Landuyt K, Lambrechts P, Van Meerbeek B, et al. Clinical effectiveness of contemporary adhesives: A systematic review of current clinical trials. Dent Mater 2005;21:864-81. Van Meerbeek B, Peumans M, Poitevin A, Mine A, Van Ende A, Neves A, et al. Relationship between bond-strength tests and clinical outcomes. Dent Mater 2010;26:e100-21. Heintze SD, Rousson V, Hickel R. Clinical effectiveness of direct anterior restorations – A meta-analysis. Dent Mater 2015;31:481-95. Peumans M, Van Meerbeek B, Lambrechts P, Vanherle G. The 5-year clinical performance of direct composite additions to correct tooth form and position. I. Esthetic qualities. Clin Oral Investig 1997;1:12-8. Beun S, Glorieux T, Devaux J, Vreven J, Leloup G. Characterization of nanofilled compared to universal and microfilled composites. Dent Mater 2007;23:51-9. Coelho-de-Souza FH, Gonçalves DS, Sales MP, Erhardt MC, Corrêa MB, Opdam NJ, et al. Direct anterior composite veneers in vital and non-vital teeth: A retrospective clinical evaluation. J Dent 2015;43:1330-6. Peumans M, Van Meerbeek B, Lambrechts P, Vanherle G. The 5-year clinical performance of direct composite additions to correct tooth form and position. II. Marginal qualities. Clin Oral Investig 1997;1:19-26. Estay J, Martín J, Viera V, Valdivieso J, Bersezio C, Vildosola P, et al. 12 years of repair of amalgam and composite resins: A Clinical study. Oper Dent 2018;43:12-21. Rauber GB, Bernardon JK, Vieira LC, Baratieri LN. Evaluation of a technique for color correction in restoring anterior teeth. J Esthet Restor Dent 2017;29:309-16. Ruschel VC, Stolf SC, Shibata S, Baratieri LN. A conservative technique for repairing class IV composite restorations. Oper Dent 2017;42:E10-5. Peumans M, Van Meerbeek B, Lambrechts P, Vanherle G, Quirynen M. The influence of direct composite additions for the correction of tooth form and/or position on periodontal health. A retrospective study. J Periodontol 1998;69:422-7. Hahn R, Weiger R, Netuschil L, Brüch M. Microbial accumulation and vitality on different restorative materials. Dent Mater 1993;9:312-6. Brianezzi LF, Brondino BM, Chaves GC, Ishikiriama SK, Furuse AY. Interdental papilla formation after diastema closure. Gen Dent 2017;65:e13-6.